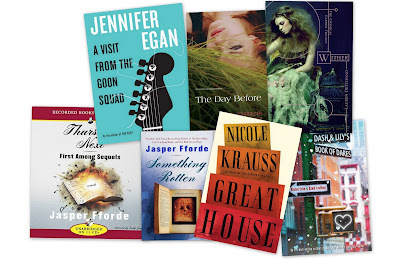 The Sunday Salon: February Books Recap [3.5.2011] – my books. my life. Good morning! How is everyone today? I am having a rough weekend back/neck/head-wise but it has forced me to actually get some reading done. I finished both Matched by Ally Condie and The Weird Sisters by Eleanor Brown yesterday. And today, I am starting the book that at least 7000 of you told me to read after my Top Ten Tuesday post: The Handmaid’s Tale by Margaret Atwood. I LOVE Dash & Lily!! My favorite February read was definitely The Bronze Horseman by Paullina Simons. It’ll probably be one of my favorite for the whole year. Haha, finally! Hope you’ll love The Handmaid’s Tale! I can’t wait to see what you think of the Handmaid’s Tale! Sorry you aren’t feeling well. Ooh I’m reading The Weird Sisters right now. Look forward to your review! Oh, I just finished The Weird Sisters, too! LOVED it…. I also really loved The Handmaid’s Tale…the book and the movie. I am jealous that you read so many of the books that are sitting on my shelf and making me feel guilty. Dash and Lily’s sounds fun. I’ve heard lots of good things about both Matched and The Weird Sisters. I hope you enjoy The Handmaid’s Tale – I’ve actually never read it, but perhaps I should? The Goon Squad rocked my world! It will most definitely end up on my favorites for the year. I’m listening to Weird Sisters right now, and I am loving it! I had a rough weekend too (food poisoning) but managed to put a big dent into The Little Stranger since I was unable to do much else. I read half of Wither in February but then put it off since it isn’t coming out for awhile. I tend to read things too early and then forget all about them when I need to write the review. What I read of it, I liked.